Maigret is disturbed in his tranquil retirement by Maître  Motte, the notary of Châteauneuf-sur-Loire. The notary, a collector of miniature carved and engraved ivory statues, has noticed that several items of great value have disappeared from his collection. He calls on the former police chief to discover the thief. Maigret goes, rather grudgingly, under a false name, to the home of the notary where he can observe the daily life of the family. The notary has three daughters. One of the girls, Armande, will soon marry Gérard Donavant, the son of a famous swindler called The Commodore. Is Gérard the thief? Or is there someone who would like to discredit him by making him look suspicious? The first clerk of the notary, Jean Vidier, for instance. He would have liked to marry Armande in order to inherit the notary's study  one day. Or the notary himself. Maybe he shams a theft so that he can avoid welcoming in his family, which he wants to be harmonious, the son of a swindler? In fact, Maigret discovers that the truth is very different: Armande 's 16-year old sister, Emillienne, is madly in love with the alluring Gérard. bougie The notary of Châteauneuf, who is naturally one of the main characters in this story, but who also plays a role in several other Simenon-novels, was inspired on the real notary of Châteauneuf-sur-Loire, Me Olivier Goussard. 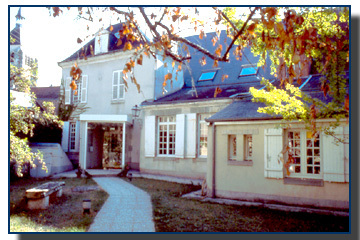 In 1934 Simenon buys the property "Le Bois Bezard" near Seichebrières, a village in the middle of the Fôret d'Orleans. On this piece of land (28 ha - 69 acres) stand the ruins of an old farm building which he wants to demolish. On that spot he plans to construct a house of tree trunks. After a while however, he finds that the surroundings and the climate in the Fôret d'Orleans are disagreeable and disheartening and he decides to resell the property and buy a country house on the island of Porquerolles in the Mediterranean . Because the notary of Châteauneuf is charged with the formalities of drawing up the notarial deeds, he has to meet Me Goussard a number of times. Both men like to talk together and to discuss a gamut of subjects and develop mutual respect and trust. And apparently the notary makes an impression on Simenon. His personality, his family and his home are of considerable importance in this short story. In countries under a Latin law system the functions and duties of a notary are considerably different from those of the notary public in the common law system. In "Latin law"- countries the notary is a high-ranking official with considerable legal skills and training. Unlike the U.S. Notary, he drafts documents, provides legal advice, settles disputes and archives documents. Like an attorney, a notary is a professional legal adviser with clients who pay for his advice, but like a judge, a notary is appointed by the Crown or by the President 'for life'. The second important feature: a notary is independent and more importantly, he is impartial. Unlike a legal advisor or an attorney-at-law, a notary does not act for just one party. Instead he is required to weigh up and balance the interests of all the parties in a certain legal matter. A notary stands, as it were, above the parties. When real property is conveyed, a notary for instance acts for both the vendor and the purchaser. A notary who is always academically trained, is a legal expert on family law, the law of inheritance, business law and property law. The town of Châteauneuf-sur-Loire (7.143 inh.) 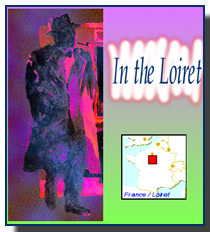 is situated in the Loiret (45) department at about 140 km (87mi) south of Paris and 45 km (28mi) from Meung-sur-Loire where the retired Maigret lives. The notary of Châteauneuf-sur-Loire who inspired Simenon, Me Goussard, had his study in the Rue Gambetta. The entrance of the dwelling-house however was on the backside of this building on the Place des Douves, Although these streets are situated in the center of the town, less than 100 m from the town cathedral and the main street, La Grande Rue, it is a remarkably quiet, small, almost triangular shaped square. In France, as in other European countries, a notary has a high social status and because the number of candidates appointed is very limited the position used to be almost hereditary. As a result of this every town and city had his "dynasty" of notaries, passing on the study from father to son. 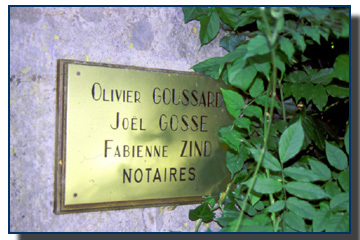 So, there is a real chance that there still is a notary Goussard in Châteauneuf. And in fact, there is! The present-day Me Goussard is even called, Olivier, after his grandfather who was Simenon's notary in 1934, the man who stood model for Me Motte in the story. 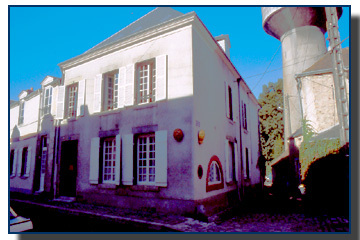 The study is still in the same house, although the entrance is now where the entrance of the dwelling-house used to be, on the Place des Douves. The inside is of course transformed and nobody lives there anymore, it's all offices now. 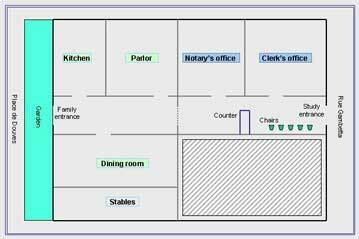 The house as it is described in the story could well be the actual house of the notary. There are some striking similarities. In any case Simenon's general discription reproduces the character of this house remarkably well. 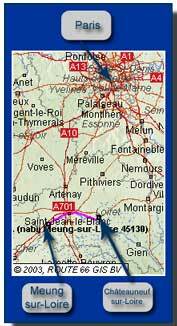 "However the house of the notary of Châteauneuf was preeminently a house of the province. Like they were built in the old days, without petty-bourgeois traits, without annoying eye-catchers, with nothing ugly nor aggressive." "The gilded sign of the notary was not put up near the main door flanked with two stone columns. The study had, a little further, its own entry and it could be distinguished by the stained glasses in its windows that were different from the other windows in the house." In that time, in the house of the real notary, the state of affairs was roughly the same. The entrance of the study was on the other side of the house than the family-entrance. 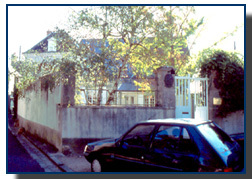 In the Rue Gambetta, the way in to the study. On the Place des Douves the doorway for the family. On the plan the situation in the house is delineated as it was in Simenon's time, when he visited the notary to talk about the purchase of the property in Seichebrières. A notable distinction with the description are the proportions and the location of the garden. "The servant-girl opened the glossed door to him and receded straight away to let him pass. She closed the door again and announced: everybody is in the garden..."
In reality this situation would have been unlikely, because one has to pass by the garden to get to the doorway of the family-part of the house. So Maigret would have encountered the family, if they were in the garden, before reaching the door. The proportions of the garden are not explicitly mentioned but it is suggested that it is rather large. There is a gardener and Emillienne and Gérard are strolling in the garden while Maigret is taking a walk there too. In reality the garden is tiny. It is enclosed by a wall and bounded on one side by the house and on all other sides by the surrounding streets. It is customary for Simenon to adapt some of the features of the localities and the surroundings to fit the story and to complete the image that he wants to convey to the reader. But the fundamental qualities of the locality are maintained and there is little doubt that the house of the Me Goussard inspired the author when creating the setting in which the story of Me Motte would be placed. 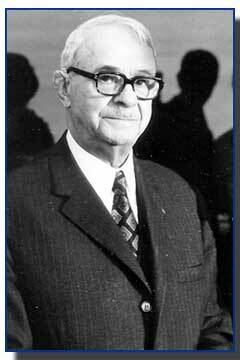 - Maître Olivier Goussard, Photo: coll. Me Jean Goussard. - Logo Conseille des notaires de France. - Gilded sigh of the notary study, Back, Place des Douves. Photo: G. de Croock. - House of the notary, back, Place des Douves. Photo: G de Croock. - Plan of the house of the notary of Châteauneuf-sur-Loire, G. de Croock. - Outside the garden and garden-wall, Place des Douves, Photo: G. de Croock. (1) Maître (Fr. ): Master, form of address in French-speaking European countries for a lawyer, barrister or notary. Abbreviation: Me. (2) The practice of a notary is called a "study", in French: "étude". (3) Translation and compilation from: Maurice Piron, L'Univers de Simenon, Presses de la Cité, Paris, 1983, p.451. Translation of excerpt: G. de Croock. (4) See: Mon ami Maigret. (6) Georges Simenon, Le notaire de Châteauneuf. In: Oeuvres Complètes, Tome IX, Edition Rencontre, 1967.